I have to warn you. This book is not a perfect one and it is written by a less-than-perfect human being. If you are looking for the perfect person to tell you how to get out of your trouble, I am the wrong one. But if you want to unearth and release your wrong and disabling beliefs about yourself and others, find your true Self and learn to live from your heart, then I am at your side. Are you haunted by the impression that you have already tried everything? With motivation and enthusiasm have you read books, been to seminars and have really given your best to communicate in a “nonviolent” way? Have you been driven by the true intention to improve the relationships in your life – with your partner, your family, your coworkers or your friends. But you still have that feeling of hitting an invisible wall? Perhaps what looked so easy when Marshall Rosenberg was doing it, so convincing during the role plays in workshops and sounded totally clear in those books just isn’t working in your life? At least, not in those relationships that truly matter to you? If this sounds true to you, you are most likely unnerved, exhausted and doubting yourself. And there may be anger towards the others who unfortunately do not behave like the ideal partners in role plays, workshops and books, but stubbornly keep driving you crazy – and are totally unimpressed by all your efforts. Well, it wouldn’t be surprising if you were about to give up. But surely you have not yet, because deep down inside you hunger far too much for a real change, for a new quality in your relationships which is marked by mutual understanding, consideration and care. You are not willing to settle for what you have. You long to live a joyful and fulfilling life. I would like to confirm to you that what is driving you is absolutely valid and leading you to the right direction. What you are looking for exists. It is waiting for you, and you will find it. The only thing is: Getting that is a much longer and more challenging path than we first suppose. We think we can do it, if we just visit a few classes and read a couple more books.Or at the latest, after the year-long intensive training, right? Well, sureley we’ll get it after the next 10-day-retreat! What we are absolutely unaware of (and that might be better to get us started) is that before us lays a long path of transformation which requires all our endurance and willingness to surrender. goal, you will reach it. All you need is a consistent change within yourself. I say this not to put you off. I merely want to let you know that you have chosen the biggest challenge life has to offer. Therefore it is normal to have the impression that you are supposed to learn an exotic language, far too difficult to even try. But no, it is possible. However, you won’t get anywhere if you only try to be “nonviolent” once in a while in a situation here or there and apart from that continue as before. The trick lies in practising again and again and to let reacting nonviolently become a habit which underlies every moment of your day. And when you start, this is everything but easy. Our society is dominated by a countless number of thinking and behavior patterns that alienate us from ourselves and each other and that lead to conflicts. This is the beginning of violence. Have you ever had the opportunity to watch a small child and how eagerly it imitates the adults around himself? Isn’t is actually heartbreaking to see, how hard it is trying to be like them? And so have we copied the people around us. By doing so, we have adopted a lot of stuff that is unfortunately in our way when it comes to creating relationships and a satisfying life. We are influenced by such old patterns through and through, and it can’t be any different than that, because we simply lack examples about how it could be different. We didn’t have any back then. to meet one of “them” without prejudice – and fear. You don’t know anything else and will be just as afraid of that other group as the generations before you. And if you come to the point of being tired of the whole thing and wanting to mediate between the two groups you first have to deal with your own fears. You have to start with overcoming your own, deeply rooted mistrust, and for that to happen you first need to become aware of the fact that you are full of mistrust and anger. You need to acknowledge it. Because of these feelings you probably behave a lot more defensive and uncompromising towards members of that group than you behave towards other humans, and this keeps the vicious circle of mutual rejection alive. fears and our effect on others is not exactly heart opening. We think our behavior and what drives it are natural, but this is only because what we have taken in during our early years has taken dominion of our subconscious and rules our life from there. Remember your driving lessons? In the beginning you had to concentrate on every little action and it was pretty exhausting to think of everything and get it right. Then, after a while, things happen without effort. Start the engine, engage a gear, look into the mirror, indicate, go. And while all of this is happening, you can even chat with your passenger! But it does get tricky if you suddenly want to drive an automatic car. In this case you have to unlearn what you have learnt and learn something new. It takes a conscious effort to stop yourself from hitting the non-existent clutch. Again it’s a bit tiring and takes a while until everything goes automatically. 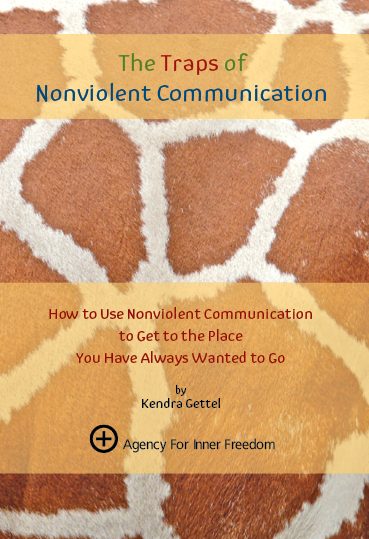 Nonviolent Communication, but are driven by our old fears and patterns and therefore do not have the powerful and transformative effect that you are looking for. This leads to the assumption, we were following NVC but it didn’t work. not looked into Nonviolent Communication yet or have only little experience with it. Should you be one of these readers you might find the short introduction to NVC at the beginning of the book helpful. It will enable you to understand the references to Nonviolent Communication and will tell you, for example, what is meant by “giraffes” and “wolves”. If you are already familiar with NVC, you can skip the introduction. power of your heart which gives Nonviolent Communication its power. myself, and sometimes even still do today! agree with, others you will reject, some you will find helpful and some not. Start your own journey of exploration, because only you can find out what works for you. out of which we will automatically live nonviolently – our miracle working giraffe heart. By no means does this turn us into doormats – a suspicion often raised concerning nonviolence. Just the opposite, we will discover the power of our true self in order to make a difference in the world. There is not bigger power than ours. In love. And peace. Because a life of love and peace is simply more fun!